Gutter Cap® is a closed, one-piece gutter protection system. » See Before & After Photos! 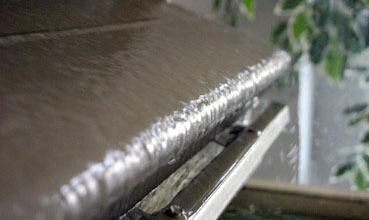 It allows your gutter to work at full capacity as a free flowing system. It allows your gutter to work at full capacity as a free flowing system. See before & after photos! The Gutter Cap design is proven to work far better than traditional screens and vinyl caps. Screens quickly clog with small twigs, leaves and other debris, plus they cave in from snow and ice. Vinyl Caps collapse at bending points and opening slots too…causing clogging and are hard to protect from small animals. Gutter Cap is constructed using the finest metals and comes with a lifetime warranty. Gutter Cap is a must for the bitter midwest winters! Ice and snow build up in gutters, causing gutter seams to break! In addition, the weight of heavy snow causes gutters to loosen while the back up of ice behind gutters causes moisture damage to fascia. The Gutter Cap® combines surface tension with "capillary action!" This patented design allows rainwater to adhere to the dome of the cap while leaves and debris blow OFF the roof. Your existing gutter is a free flowing drainage system with Gutter Cap®. Gutter Cap® saves you the time, hassle & DANGER of cleaning gutters...plus saves you upwards of thousands of dollars in damage each year! Paula Sands of KWQC News Channel 6 did a report on how the Gutter Caps are installed. » Ron Hazelton puts Gutter Cap® on his home! Please enter the number 65372 in the box provided below.